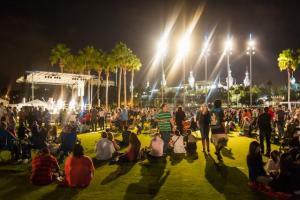 Tonight… the weather ROCKS and so does Curtis Hixon Park! The weather could not be any more perfect for tonight’s Rock the Park in Tampa’s downtown waterfront park, Curtis Hixon Park. Located in the heart of downtown Tampa and along the Riverwalk many locals and visitors can agree this is one of their favorite spots day and night. Starting at 6:30 tonight the park will transform into a spectacle of show lights and showcase local musical artists such as: Thomas Wynn & the Believers, The Groves and Mike Mass: Artist and Producer for a FREE concert. Grab your favorite chair or blanket and invite your friends, co-workers, neighbors, family, etc… and come out ready to rock the night away. Expect a beautiful, relaxing, vibrant setting looking over the Hillsborough River. Rock the Park concerts usually run from 6:30 p.m. until 9 p.m. so make sure you bring some extra cash to enjoy some food and drinks (available for purchase on premise).